In January, the composite purchase manager index (PMI), a major survey-based business cycle indicator, dropped to a new low (50.7 after 51.1). The index remained above the expansion threshold (50) and keeps indicating weak growth in economic activities in the Euro Area. The manufacturing and services sector components fell to 50.5 (after 51.4) respectively 50.8 (after 51.2). The German manufacturing PMI index tipped below the expansion threshold (49.9) for the first time since 2014 (Figure 1 - see pdf). In France, while the manufacturing PMI rebounded gradually (to 51.2 from 49.7), the services index came out particularly weak (47.5 after 49). This could be related to the political “gilets jaunes” protests. The Italian manufacturing PMI rose gradually (49.2) but has been in contraction territory since October. At the same time, the ifo-business climate, the most prominent business survey for the German economy, dropped sharply to the lowest level since 2016 (99.1) indicating a growth slowdown in Germany. Purchase manager indexes are highly correlated with GDP growth. A simple linear regression implies 0.2 % quarterly GDP growth based on the January PMI outcome. In line with that, our own nowcasting model for the Euro Area is indicating 0.2 % (q/q) GDP growth for Q4 of last year and a one period ahead forecast is at 0.3 % (q/q) for Q1 2019. Both indicate that no growth rebound occurs after the weak GDP growth (0.2 % q/q) in Q3 2018 and contradict the ECB staff GDP projection from December. The ECB forecast 1.7 % GDP growth for 2019, which implies a pick-up in quarterly GDP growth. Hence, risks for this forecast are tilted to the downside. The ECB staff will likely have to revise downward its 2019 GDP growth projection in March. At last week’s meeting, the governing council (GC) of the ECB left the interest rates on the main refinancing rate, the marginal lending rate and the deposit facility unchanged at 0.0 %, 0.25 % and -0.40 %. Also, the ECB’s forward-looking communication (“forward guidance”) was left unchanged as it expects the key interest rates to remain at their present levels at least through the summer of 2019, and in any case for as long as necessary to ensure the sustained convergence of the inflation rate to the inflation target. In addition, the GC intends to continue reinvesting, in full, the principal payments from maturing securities purchased under the asset purchase programme for an extended period of time past the date when it starts raising the key interest rates. We reckon that this would be around two years. President Draghi highlighted that incoming information about the Euro Area economy has continued to be weaker than expected on account of softer external demand and some country and sector-specific factors. The near-term growth momentum is likely weaker than anticipated previously. In difference to the December statement, risks to the growth outlook have now moved to the downside. For the scenario that a growth rebound will fail to occur, additional measures to loosen monetary policy are discussed, including long-term refinancing operations (LTROs) and targeted long-term refinancing operations (TLTROs). These measures were introduced to restore the transmission of monetary policy through the credit channel. Essentially, this means that lower policy interest rates should translate into lower bank lending rates. They address a credit crunch. TLTROs provide long-term funding at attractive conditions to banks to stimulate bank lending to the real economy. The 1st series of TLTROs was announced in June 2014 and the 2nd series (TLTRO II) in March 2016. The amount of these operations – the amount that banks can borrow – is linked to the loans to non-financial corporations and households. The TLTRO II linked the interest rate to be applied to the participating banks’ lending patterns. The more loans a participating bank issues to non-financial firms and households, the more attractive the interest rate on their TLTRO II borrowings became. These operations had four-year terms and a current outstanding amount of 740 bn EUR. Early repayment of the TLTROs is possible since June 2018 and the first TLTRO has its final maturity in June 2020. Figure 2 (see pdf) shows interest rates on bank loans for non-financial corporates (over 1 & up to 5 years maturity), which have declined considerably in peripheral countries since the Euro crisis 2011/12. 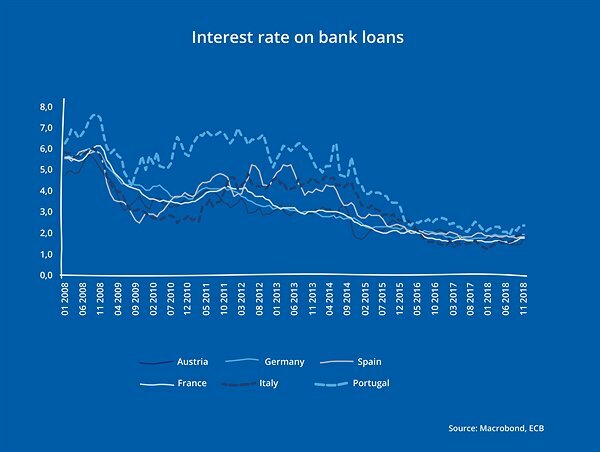 In 2014, bank loan interest rates were 3.6 %, 4.3 % and 5.1 % in Spain, Italy and Portugal. They decreased substantially to average 1.8 % (ES), 1.7 % (IT) and 2.2 % (PT) in 2018. At the same time, credit lending to non-financial corporates and households has been recovering (Figure 3 - see pdf). In 2014, the total amount of loans to non-financial corporations had fallen to 4.3 trillion EUR from 4.7 trillion EUR in 2011. Since then, the amount has been rising to 4.4 trillion EUR in 2018. In November, bank lending to non-financial firms rose by 2.9 % annually. The total outstanding amount of loans to households rose from 5.2 trillion EUR in 2014 to 5.7 trillion EUR in 2018. Consumer loans and loans for house purchases increased by 6.7 % and 3.3 % (y/y) in November 2018. According to the January 2019 bank lending survey, credit standards remained broadly unchanged for loans to enterprises and housing loans compared to the previous quarter (Figure 4 - see pdf, minus = easing, positive = tightening). Given the extended period over which credit standards have been easing, bank lending conditions continue to support loan growth. In addition, loan demand continued to increase across all loan categories, according to the survey. Lower interest rates on bank loans, the recovery in credit supply and easier bank lending standards are evidence that a continued credit crunch could be avoided since 2014 and the transmission of monetary policy to the real economy through the lending channel was restored. The Euro Area banking sector is not in the situation that prevailed until 2014. The ECB would not tighten monetary policy into a slowing economy. We believe that, first, we would have to see a growth rebound in the coming months and, second, a sustained medium-term convergence of inflation – driven by a continuous rise in labor cost – towards the ECB’s inflation target, before the central bank would start to increase its main policy interest rates. Long-term refinancing operations, in particular TLTROs, likely helped to restore the credit channel but would not be the most adequate monetary policy instrument to target a growth slowdown; except for its signaling function. Nevertheless, the ECB has continuously been issuing LTROs with a 3-month maturity and could lengthen the tenor of these operations, in case outstanding operations (TLTROs) will be repaid early in the coming months.